Affects activity of longevity genes! 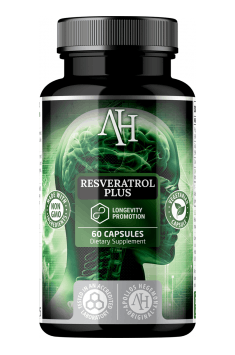 Apollo’s Hegemony Resveratrol Plus is a dietary supplement containing resveratrol, a grape seed extract, and coenzyme Q10. The unique combination of health-improving compounds displays powerful antioxidant properties, supports the health of the cardiovascular system, and has a beneficial effect on cell metabolism. The preparation is suitable for vegans and vegetarians. Resveratrol is a natural polyphenol compound of the group of phytoalexins, that is substances synthesised by plants in response to some negative external factors, such as UV radiation or injury. Resveratrol is present in, for example, red grape peel and is one of the most thoroughly tested natural polyphenols. Resveratrol has a wide range of health-improving properties, the most important being antioxidant, anti-inflammatory, antiplatelet, and vasodilating effects, which translate into the cardioprotective action of this compound. Resveratrol affects the activity of the so-called longevity genes. Tests on animals showed that resveratrol has an effect on the genes connected with lifespan, that is SirT1, FoxO, and PBEF, imitating the effects of calorie restriction. The tests demonstrated increased cardiac cell survival, which indicates the cardioprotective effect of the compound. Just as calorie restriction, resveratrol has a positive effect on insulin sensitivity, leading to a reduction of the levels of glucose, insulin and IGF-1 (insulin-like growth factor 1). Therefore, resveratrol can prove beneficial in the case of insulin resistance and overweight as well. Grape seed extract is a rich source of polyphenol compounds. It contains a lot of substances, the most important being catechins, proanthocyanidins and phenolic acids, which have a confirmed beneficial effect on the functioning of the circulatory system. Thanks to significant antioxidant action, proanthocyanidins inhibit the activity of the enzymes degrading blood vessel walls and prevent dysfunction of the vascular epithelium. Research shows that the compounds contained in grape seeds can reduce blood pressure, improve circulation, reduce swelling of legs, and reduce cholesterol levels. Along with resveratrol and coenzyme Q10, they have the ability to stimulate the production of nitric oxide (NO), that is a gas transmitter responsible for the relaxation of smooth muscles in blood vessels. Coenzyme Q10 (CoQ10) is a compound found naturally in the organism classified as a vitamin-like substance. The right amount of CoQ10 is essential for normal cell metabolism, as it participates in the production of energy in the electron transport chain (ETC) in the mitochondria. CoQ10 is found outside the mitochondrion as well: it is present in, for example, biological membranes, where it performs antioxidant, stabilising, and phospholipase A-inhibiting functions. Phospholipase A takes part in the release of arachidonic acid from cell membranes, a substance consisting a substrate for the synthesis of pro-inflammatory compounds. Coenzyme Q10 is one of the main lipophilic antioxidants. As a transporter of protons and electrons, CoQ10 can bind free radicals, protecting lipids from peroxidation as well as the DNA and proteins from oxidative damage. CoQ10 prevents the harmful oxidation of lipoproteins in blood, including LDL, that way preventing the development of such diseases as atherosclerosis. Moreover, CoQ10 increases the regeneration of α-tocopherol (vitamin E), maintaining its antioxidant action. Just like resveratrol and grape seed extract, CoQ10 is highly beneficial for the cardiovascular system in particular. Endogenous CoQ10 production decreases with age. A decrease in the level of the compound in the body results in lower efficiency of the production of high-energy compounds and reduced antioxidant barrier, which in turn contributes to the development of lifestyle diseases, particularly those connected with the circulatory system, as well as distorted cell metabolism, faster aging processes, low energy levels, and chronic fatigue. Low CoQ10 levels are also observed in some neurodegenerative diseases, such as Parkinson’s disease. To sum up, Apollo’s Hegemony Resveratrol Plus is a high-quality preparation that supports natural lifestyle disease prevention. It supports the health of the cardiovascular system, strengthens the antioxidant barrier of the organism, promotes normal energy metabolism and cell energy production, and helps to maintain optimal health for many, many years. Take 1-2 capsules daily, with or without a meal. It is believed that resveratrol is best taken before bedtime and at least 30 minutes after a meal, as that is when the activity of sirtuins is the highest. More and more recent studies indicate the chemopreventive potential of resveratrol. The activity can be reinforced by combining it with quercetin. Some drugs, like statins, result in a decrease of the coenzyme Q10 level in the organism. Microcrystalline cellulose, capsule shell (vegetable cellulose). Dietary supplement containing iron and vitamin C. Supports the red blood cells production. Prohormone of anabolic potential of a unique composition containing Estra-4,9-diene-3,17-dione.